Safe in her nest of fragile twigs and petals, a bird sits on tiny eggs, awaiting the moment when her hatchlings join her. Light radiates from her eyes like love, and her chicks are her only passion. 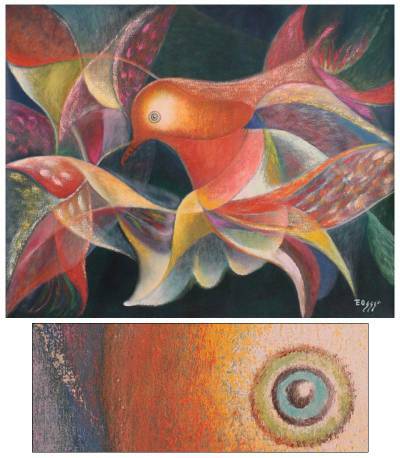 Birds and their flight are favorite themes for Peruvian artist Theus. Working in lucid oils, he instills the composition with gentle, glowing color.